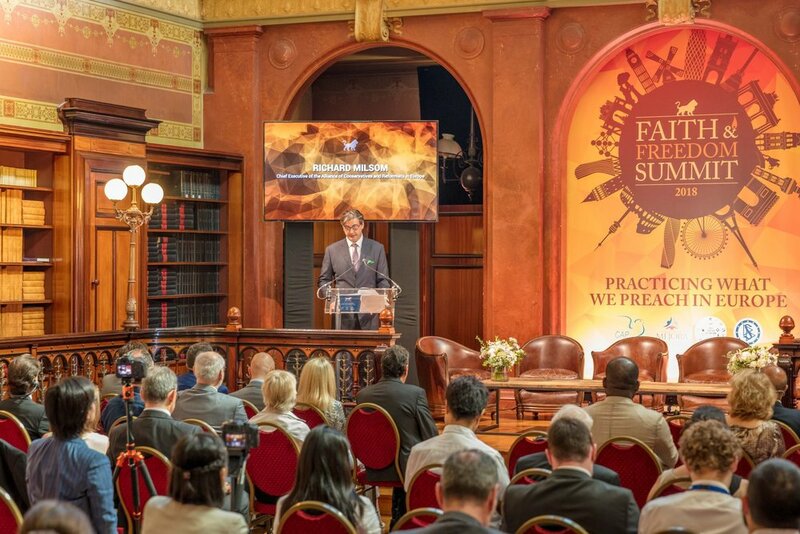 BRUSSELS—On June 28 at the Solvay Library, situated just behind the European Parliament in the Parc Leopold, a large group of faith and government representatives met in what has been termed the launch of the Faith and Freedom Summit. Dr. Ahmed Shaheed, U.N. Special Rapporteur on Freedom of Religion or Belief; Jan Figel, EU Special Envoy for the promotion of freedom of religion or belief outside the European Union; Amjad Bashir MEP, Member of the Foreign Affairs Committee, European Parliament; Sam Brownback, U.S. Ambassador at Large for International Religious Freedom; Congressman Bob McEwen, Former Member, American Delegation to the European Parliament; Richard Milsom, Chief Executive of the Alliance of Conservatives and Reformists in Europe; Bashy Quraishy, Secretary General of EMISCO (European Muslim Initiative for Social Cohesion); Ivan Espinosa de los Monteros, Director of International Affairs for VOX (Spanish political party); Dr. Eli Nacht, Official Representative of International Committee of Human Rights in Israel; Patricia Duval, Human Rights Attorney; Willy Fautre, Director of Human Rights Without Frontiers International; Dr Aaron Rhodes, President of the Forum for Religious Freedom-Europe; Professor Marco Ventura,Professor of Law & Religion at University of Siena; Hans Noot, Director of the Gerard Noodt Foundation; Ivan Arjona, President of the European Office of the Church of Scientology for Public Affairs and Human Rights; Greg Mitchell, Co-Chair, International Religious Freedom Roundtable; Vincent Berger, Former Jurisconsult of European Court of Human Rights; Archibishop Thomas Schirrmacher, President of the International Society for Human Rights; Dr. Juan Ferreiro Galguera, Professor of Law and Religion, University of A Coruña; Rosita Soryte, Lithuanian diplomat, President of the International Observatory of Religious Liberty of Refugees; Kristina Arriaga de Bucholz, USCIRF Commissioner and Vice-Chairwoman of the Commission; Dr. Alessandro (Alex) Amicarelli, Chairman of the European Federation for Freedom of Belief (FOB); Martin Weightman, Director of the All Faiths Network; Adina Portaru, Legal Counsel for ADF International in Belgium; Eric Roux, Vice President of the European Office of the Church of Scientology for Public Affairs and Human Rights.